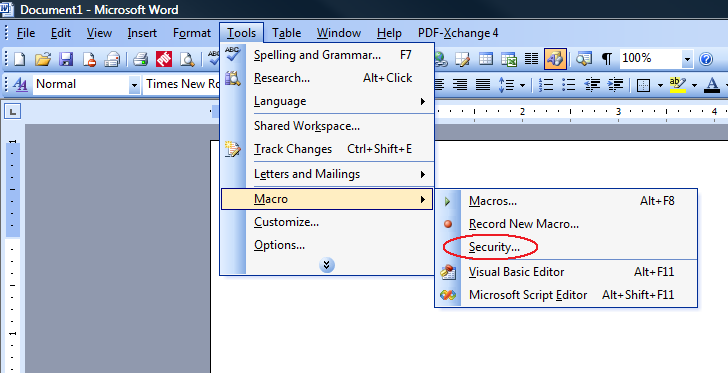 Tracker Software Products :: Knowledge Base :: I installed PDF-XChange 4.0 / 5.0 (2012) but the Office Addin Toolbars are not available in my MS Office 2003 applications. The 2 most likely things to stop the installation of the toolbars, are Anti-virus/Internet Security suites or MS Office security settings. If you are running a security suite, typically, they will prompt you during the installation of PDF-XChange to either allow or deny access to system settings that are needed to make the Addin work. If you see such a message you will need to allow access. Help->About Microsoft Office [Product]->"Disabled Items..."
If the PDF-XChange Add-In is listed here select it, enable it and restart your Office Application. This opens up the Security Dialogue box. It should be set to medium so as to be sure you are prompted grant access to the PDF-XChange installer. 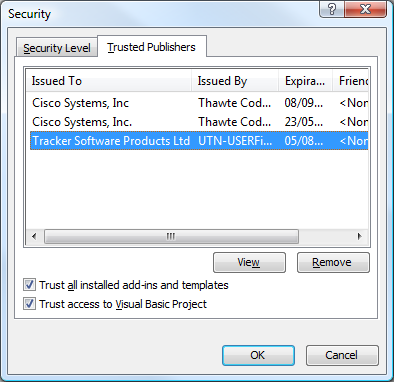 If you do not see Tracker Software Products in this list after the installation you will need to review the Security Settings in the screen above. Set it to low, run the installer again then set it back to Medium.